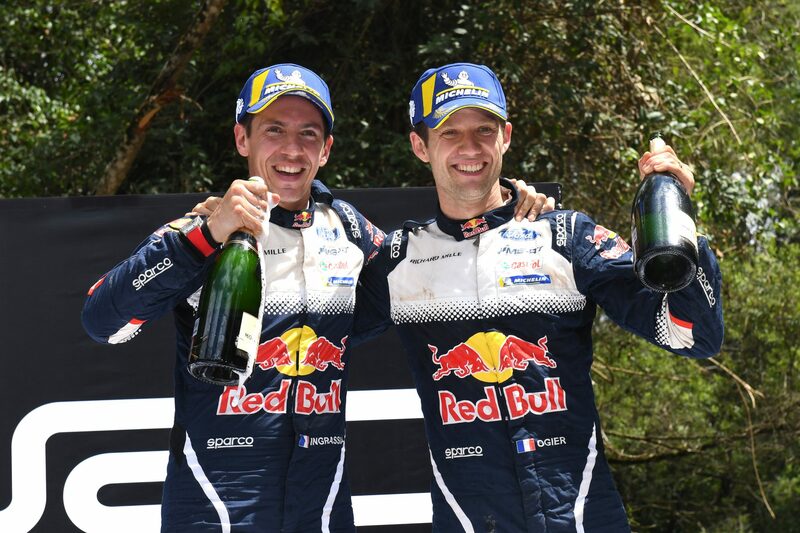 COFFS COAST (NSW): Jari-Matti Latvala has stormed to a remarkable victory in Kennards Hire Rally Australia as French superstar Sebastien Ogier sealed a sixth consecutive FIA World Rally Championship title on the New South Wales Coffs Coast this afternoon. Latvala delivered one of his finest drives, beating Hyundai’s New Zealand pilot Hayden Paddon by 32.5 seconds while Citroen’s Mads Ostberg was third, a further 52.2 seconds behind. As several key rivals fell off the road in the closing stages of the 318km rally, Latvala delivered stunning pace on the final day to claim three of the last six stages. But it was at the expense of Toyota Gazoo Racing team-mate Ott Tanak who remained in contention for Rally Australia and the WRC driver’s title win until his Yaris came to grief against a tree on the penultimate stage. Tanak’s retirement came immediately after Hyundai’s Thierry Neuville, the only other driver who could have toppled Ogier for the WRC crown, crashed on the repeat run through Coramba (Special Stage 22). The Belgian hit a bank and tore a rear wheel off which snuffed out any hope he had of edging ahead of Ogier in the closing kilometres. The 30-year-old Neuville soldiered on for a short distance before pulling off the stage, parking his stricken machine near a spectator’s campervan. Latvala avoided the perils of an enthralling contest to become the fifth different Finnish driver to win Rally Australia, joining compatriots Juha Kankkunen, Tommi Makinen (now Toyota team boss), Marcus Gronholm and Mikko Hirvonen. Capturing the Coffs Coast event also ended a lengthy winless drought for Latvala. “It has been two very long years since I last won,” Latvala said. “I was losing hope and then this morning things changed again and these difficult conditions worked in my favour. The Finn’s triumph also cemented the first WRC manufacturer’s title for Toyota for the first time since 1999 after a season-long battle with Hyundai. Toyota ended with 368 points, 27 points more than Hyundai in a battle which went down to the wire. As much as Latvala produced a storming rally, Ogier displayed all the qualities which has made him one of the greatest of all time. Ogier claimed the title in style, winning the final Power Stage on the rollercoaster Wedding Bells test. The 34-year-old had shielded himself from risks, pushed when he had to and came up trumps in what was described as his finest season. In the end he managed to compile 219 points, 18 more than Neuville after leading the Belgian by a mere three points going into the Coffs Harbour showdown. Ogier acknowledged just how tough he had to fight to be in a position to win a sixth WRC title on the bounce. “The season was so intense and in the last two stages so much has changed,” Ogier said. “It is like a mixed feeling at this moment. I am so proud of what we have achieved and so proud of our team. You are the best. Ogier ends a hugely successful two-year stint with the M-Sport Ford operation as he moves to Citroen next season.